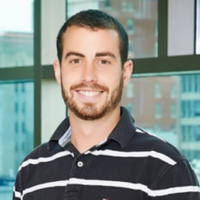 Eric Murphy graduated from Indiana University-Bloomington’s Kelley School of Business with degrees in Marketing and Entrepreneurship/Corporate Innovation in 2013 and accepted a position in Orr Fellowship with Relevance, a digital marketing firm in Indianapolis. He said that upon entering the Fellowship, he was presented with a “buffet of opportunities for personal and professional development.” Today, Eric is working for two start-ups simultaneously, one of which was founded by his father, and the other of which he founded himself. The first, Haven Technologies, manufactures and markets electronic products that enhance personal safety. The second, Condiment Connection, is one that Eric founded while still in the Fellowship and considers to be an exciting supplement to his work at Haven. Condiment Connection partners with manufacturers all over the country to market and sell famous local condiments via eCommerce.